The promos for this episode promised that it was going to be “so shocking, you’ll be talking about it the next day.” Well, here it is the next day and we’re talking about the episode, so I guess that means they were right? Actually, I have to ask what the “shocking” aspect of this episode actually was. Was it the general plot, about women being kidnapped so they can be used as baby machines? Was it the scene in which a guy gets hit by a bus? Or was it the scene at the end with Red and the Gordon Lightfoot song? It probably depends on what interests you and what you want and/or expect from this show. For me, it was the scene with Red. A woman is walking down the street all disheveled and tired, and no one will help her even though she says that her baby is gone. She makes her way to a street cop, who seems to think that she’s crazy or homeless. Then a guy comes up to them; he’s obviously lying when he says that the woman is his wife and that he has been looking for her. But before the cop can call it in, the guy kills the cop, and the woman, too. Wouldn’t you know it, this all turns out to be related to Red’s next blacklist case: a foreign adoption agency that is doing evil things. The FBI identifies the next couple looking to adopt a child through the agency, and uses them to set up a sting for the questionable organization’s lawyer. But the attorney sees that the couple is acting all nervous and places a call. The team shows up in an attempt to apprehend the lawyer before he can alert the agency about the setup, but the aforementioned bus ensures that their secret remains safe by flattening the attorney, big time. Meanwhile, Meera tells Red that she was only hired to “start the bidding process” on the updated security at the Post Office before Garrick and his team infiltrated the place. This means that, technically, she’s not the mole. (It also means I should probably change the URL for last week’s recap.) Or maybe she’s a sub-mole, and there’s a mole above her? Meera somehow persuades Red to let her go so that she can help him find out what’s going on. The team then goes to the adoption agency and meets with its head of operations, who assures them that he wants to find out what’s going on, too. Soon, the gang realizes that women are being kidnapped and having the babies while they are being held captive. They learn who the next target is but are a hair too late in preventing the college student’s abduction. As the kidnapper drives away, Liz and Ressler choose not to aim at the tires specifically and instead just shoot at the van in general for some reason. The kidnapper escapes and takes her to — yup, you guessed it — Shaw, the exec from the adoption agency. He promptly kills the kidnapper lackey, both to tie up loose ends and to show how evil he is. After the team learns the abducted women are being put into a coma while being held captive, Red takes Liz to what looks like a suburban party where young people are drinking and using drugs. Wow, Red really does know everybody — including a party-hearty drug expert, who tells them, essentially, that the drug Hydroxipan isn’t popular and a lot of people don’t use it. Conveniently, the expert’s database lists only a few doctors in the area who’d ordered it recently. Thank god for computers. Then it’s off to the only fertility doc on the list who’d ordered the drug, which is used to induce comas, only surprise: Shaw’s henchman pulls a gun on them. The goon is quickly subdued by Ressler, who also shoots the fertility doc, who was trying to escape. Liz finds a spacious top-floor room above the clinic, where many pregnant women are being sedated in beds. But here comes Shaw! He grabs Liz’s gun — but he is shot by Ressler just in time. Liz interrogates the wounded Shaw, who says that his adoptive parents didn’t really want a kid; they just needed “an accessory to smile for Christmas cards.” He swears he didn’t do the adoption scheme for the money — he did it because he was “damaged goods” as a kid and he merely wanted to leave behind a legacy. He’s the father of all the kids! So, yeah, that must have been the shocker hinted at in the promos. Of course, Liz can’t help but tie this all in to her own adoption plans and tells Tom she can’t have a kid with him. Not yet. This is probably a good decision; she knows something isn’t right between them. She asks him if he has any doubts that their marriage is broken. And he must have some, because in the next scene, he’s talking to duplicitous flirt Jolene in a car. Red shows up at Diane Fowler’s house in a scene similar to the one from Three Days of the Condor. It’s late at night and he plays the stereo loud in the dark and turns it off when she comes downstairs to see who the hell is playing music at such a late hour. He holds a gun on her and says he knows she’s the “dirty rat.” She claims that she signed off on the upgrade to the Post Office to protect him. She starts talking and talking to explain herself, and says that she knows the truth about what happened that night and the truth about his family. But Red shoots her anyway, surmising that if she knows the truth, then someone else does, too (because she talks too much). He calls the “cleaner” woman from several episodes ago and apologizes that the cleanup is messier than he expected it would be. — Last week, some readers wondered if I even like this show. I do. I really do! Promise! 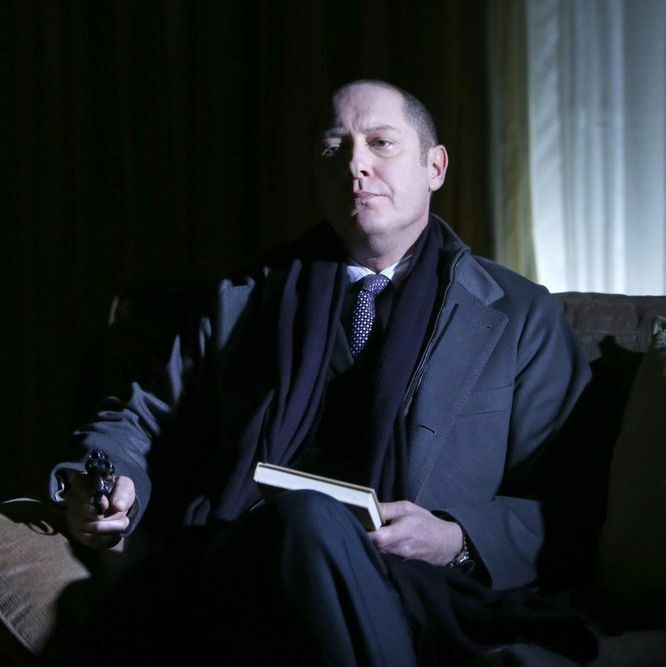 I just think it’s “good” and not yet “great.” I want more James Spader and/or evil organization stuff, and less case-of-the-week stuff. Especially when the cases seem like they could come from any FBI casework and not leads from an international criminal mastermind. But the good outweighs the bad, and I’m hooked. — I was going to say that the adoption-agency plot was a convenient way to do something parallel to Liz and Tom’s adoption story, but then Liz went ahead and said as much to Red. I’m not sure whether Red gave them this case because of what Liz and Tom have been planning, or because the writers just decided to do it and had Liz mention the similarities so they could fend off any criticism of the coincidence. — This episode was merely decent until that final scene between Red and Fowler, which took it up a notch. I guess we now know what that meeting between Fowler and Fitch and the other guys a couple of episodes back was all about. And wasn’t it refreshing to see the bad guy just get killed instead of talking her way out of it? She’s even shocked, and says, “You can’t shoot me!” Good stuff. — Why don’t Liz and Tom move? If I found out that mysterious people were watching me from across the street, with hidden cameras and microphones, and that someone had planted (supposedly) fake money and guns and IDs in a box in my floor, I would move someplace else. Not just for safety reasons but just for the creepy memories. Moving can only help their marriage, right? “That girl is cleaner than a duck fart.” — Teddy Brimley, Red’s interrogator friend, referring to Meera. I have no idea what this means, but I’ll be using it in the future.